Daily Mail is UK most visited online tabloid that brings all the latest news, sport, showbiz, business, finance, science and health stories from around the world plus Sunday newspapers news online. 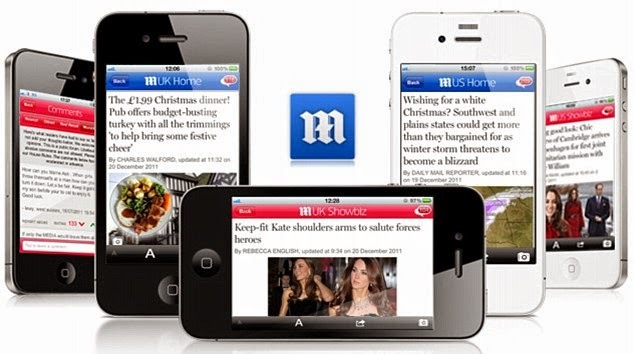 With Daily Mail mobile application, you can get the MailOnline app on your Android, iPhone, iPad, BlackBerryor Windows Phone and put it in your pocket to take wherever you go. Our brilliant app is everything you’d expect from Britain’s biggest newspaper website. If you're an existing user of the MailOnline iPhone app, download the update! The latest version of the app now has reader comments! You can do this directly from your Phone by going to the app store updates. It's got all the amazing breaking news, showbusiness gossip, glitzy pictures and fantastic sports stories that havemade MailOnline a must-have part of millions of people’s lives. So now you can access it quickly and easily on the move. But best of all, you can sync ALL the content and pictures while you’re online via Wi-Fi or a 3G or Edge mobile phone signal, then read it at your leisure ANYWHERE and ANYTIME you want. Even when there’s no phone signal, such as on the Tube or on a plane. Our new version has reader comments. • Over 15 Channels of must-read articles and photos - that's over 600+ original stories every day! • Choose which Channels you want to sync and when. We recommend that you do a Wi-Fi sync at the beginning of your day so you have access all-day long, even without a connection.